Establish your castles in the rich areas of the kingdom to gain gold, but beware as trolls and dragons may pop up and steal your riches from you! 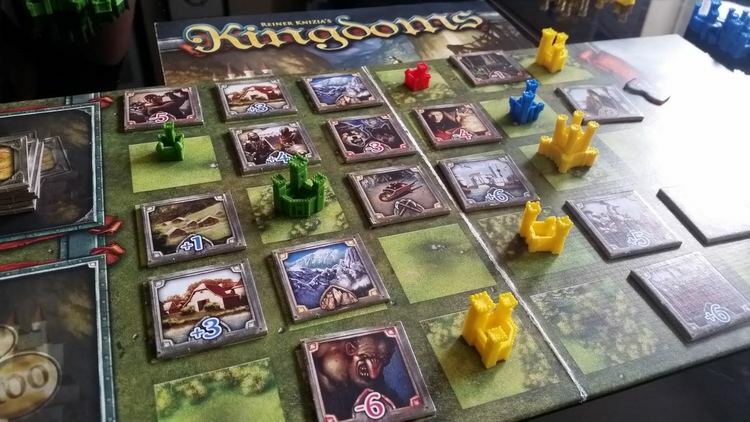 Kingdoms is one of those really easy to learn, but impossible to master games that frustrates as much as it delights! The small amount of components when you open the box is deceiving as the game packs quite a punch. The game is played over three rounds. At the start of each round everyone will take a tile that is kept secret. Each turn you may do one of three things. Draw and place a random tile, place a castle of your choice or place your secret tile on an empty square on the board. The bulk of the tiles simply have a negative or positive value from -6 to +6. (More on special tiles later) At the end of a round, when every square is filled, scoring takes place. The net total value of each row and column is added and the player awarded the sum of that value of the amount of towers on their castles. This can, of course be positive or negative. Here, yellow would score 4 on the row (5-3 x2) The mountain is blocking them scoring the +6. You have castles with either one, two, three or four towers. (One level 4 castle, two level threes, three level twos and a varied number of level ones, depending on the player count. Simple, right? Not at all! At the end of the round, the only castles you will get back will be your level ones, everything else is only used once in the game, so use them wisely! This is not a game that will win you friends though, your nice level four castle you just placed, your opponent has just popped a -6 tile next to it, meaning you have -24 points from their play! The special tiles are mountains, which are essentially just a blocker tile, meaning you can block that -6 from your castle or block an opponents castle off from some big points. There is a wizard tile that adds one tower to all adjacent castles, a gold mine which doubles all points (positive and negative) and a dragon which neutralises all positive points. All of these tiles, with the exception of the dragon can be used either to help you or hinder your opponents. This is a game that plays very well, but very differently at 2,3 or 4 players. 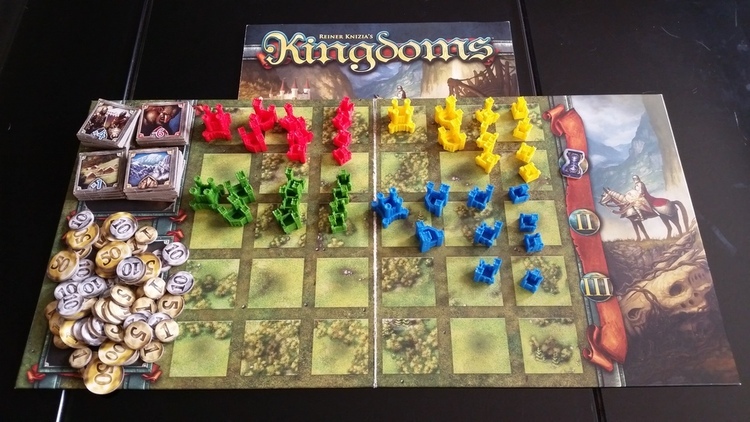 At 2 players you are forced to place more castles which can be a good thing or can cost you points. The number of level 1 castles you get to play withis determined by the number of players, with 4 players you only get two but with two players you get to use all four of them. As with most Reiner Knizia games, this is a number crunching game. 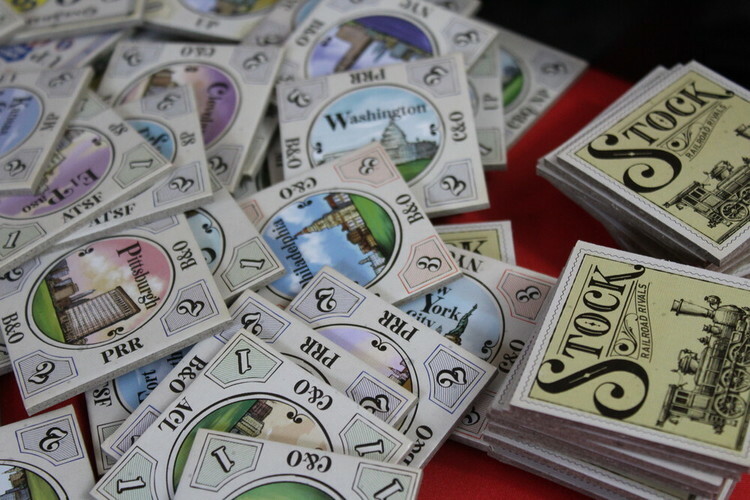 The basic premise is so simple yet the game play is totally absorbing, meaning it is easy to teach anyone, the direct conflict between players is entertaining and the board is small enough that we have played this on the train, using pen and paper to score rather than using the coins. The player castles are beautifully detailed. Our copy has the official title of the first boardgame we have worn out, we have played it that much, but its price point means we won't be upset over buying a new copy!